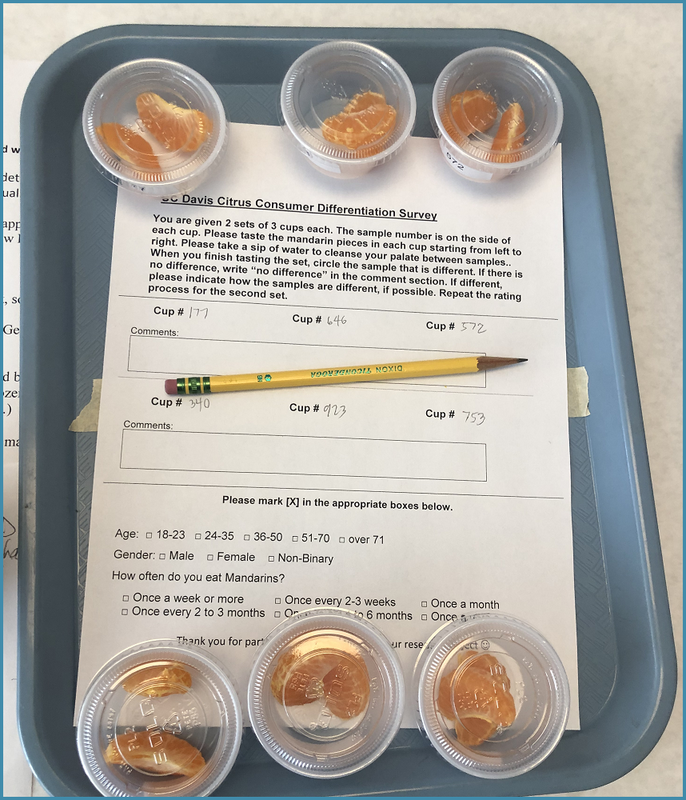 Beth Mitcham’s postharvest lab in the Department of Plant Sciences at UC Davis is determining if ethyl formate treatments affect the sensory quality of citrus fruit. Ethyl formate naturally occurs in many plants, fruits, soils, and insects. It is used as a flavoring agent in foods and beverages, and used in the fragrance and cosmetic industries. It is classified as Generally Regarded as Safe (GRAS) by the FDA. 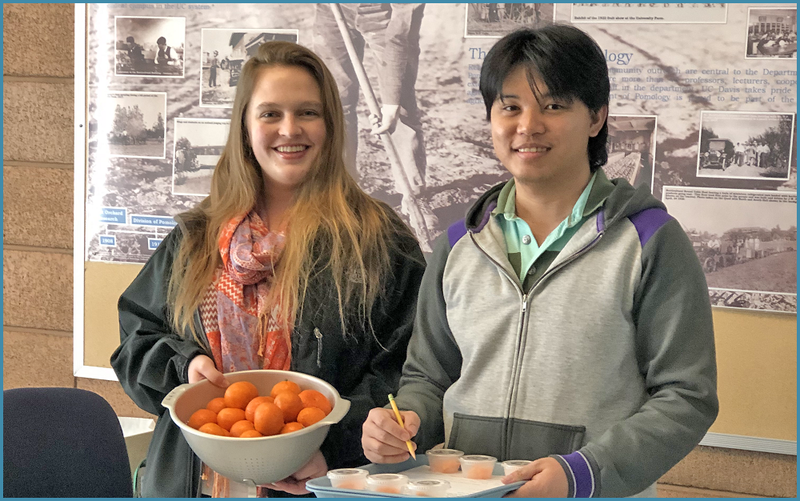 Pictured here are Junior Specialist Kelly Richmond and Ph.D. student Arlan Rodeo, both working in Mitcham’s lab. 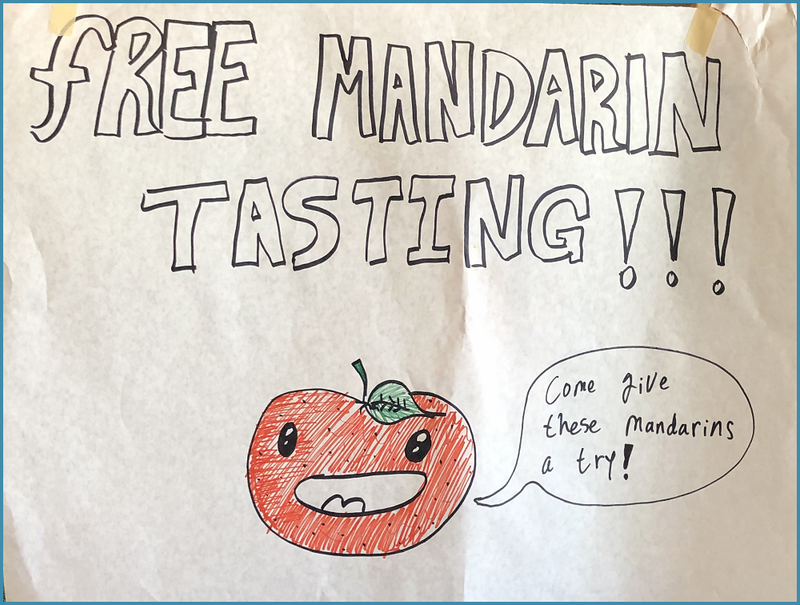 They are inviting people to taste mandarin citrus pieces and determine if there are differences in taste. Ethyl formate is currently being examined as a possible fumigant in the U.S. to control postharvest pests on/in produce. It is registered for similar use as a fumigant in New Zealand, Australia, Israel, and other countries. Beth Mitcham is a Cooperative Extension specialist and faculty member in the Dept. of Plant Sciences. In addition to this project, Kelly Richmond works with cherries, and Arlan Rodeo works with basil.